The Krugerrand was first minted way back in 1967 as an initiative to promote gold from South Africa. The government decided that this coin was a good way to promote and allow citizens to have private ownership of gold. The coin, since it was supposed to be used as currency in circulation around the country, was first made with a more durable gold alloy. During the terrible time of Apartheid in South Africa, these Krugerrands were not being accepted by most every Western nation. All of this changed in 1994 when Apartheid was done away with. 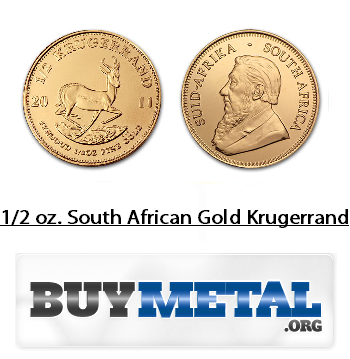 By the early 80s, South African Krugerrands accounted for about 90% of the world’s gold coins. Paul Kruger is the namesake for the coin, he was a South African Boer statesman. Kruger served as president of the Old South African Republic for four terms. Kruger’s face is what is depicted on the obverse side of the coin. The reverse side boasts the image of a Sprinkbok, the national symbol of South Africa. Coert Steynberg designed the image to be used on the reverse side. It was the same image that was previously used on the South African 5 schilling coin. On the obverse side in both English and in Afrikaans the words, “South Africa” are clearly represented. The coin is world renowned as being one of the most attractive in the world and collectors seem to love it. Its high purity is a reason that investors love the coin as well. The extreme success that the Krugerrand saw was enough for many other nations such as Mexico to start producing gold coins of their own. The US and most of Europe either started minting brand new gold coins or took their old ones off the market and changed them in order to make them stand up to the Krugerrand’s standards. In 1980 South Africa started minting three new versions of the coin; a ¼ ounce, ½ ounce, and 1/10 ounce variety were made available. The smallest of all Krugerrands has a diameter of 16.55 millimeters and a thickness of 1.35 millimeters. If you care less about the gold content itself and more about the collectibility and appeal of this coin, 1/10th ounce is the way to go. 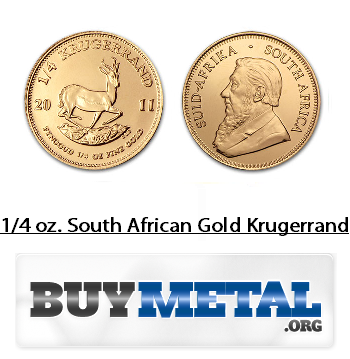 The quarter ounce Gold Krugerrand has a diameter of 22.06 millimeters and thickness of 1.888 millimeters and is most ideal for a mid range buyer or anyone who wants to mix up their portfolio with some South African coinage. The ½ ounce variety of the Gold Kruger and has a diameter of 27.07 millimeters and a thickness of about 2.215 millimeters. Fairly small for a one ounce coin, the diameter is 32.6 millimeters and a thickness of 2.74 millimeters. The actual weight of the coin is 1.0909 troy ounces. It is 22 karat gold or about 91.67% pure gold. The remaining 8.33% is copper to add strength to the coin because gold is a softer metal. 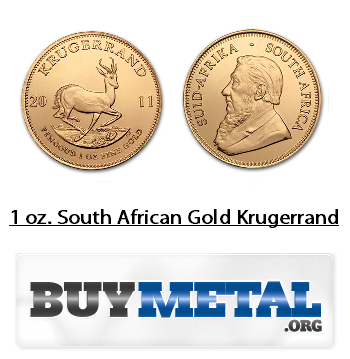 Being one of the first wholly pure gold coins around, South African Krugerrands have a lot of deserved lovers. Since it is one of the first gold coins to be released it is itself a piece of history. Another reason that makes this coin so popular is because there are not many coins from Africa for collecting and investing. Having a gold coin from this continent is a great addition to any collection. 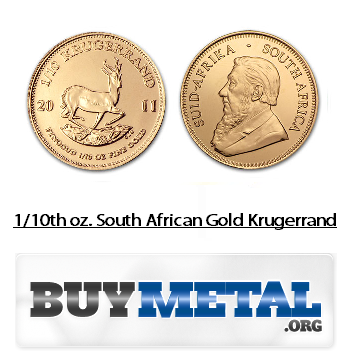 Apmex is going to be your best place to look for South African Gold Krugerrands because they are more difficult to find than most other coins. By buying on Apmex you can assure yourself that you are getting a fair deal. Shopping around is suggested because you really never know what you are going to find. The fact that these coins are pieces of history is a reason collectors flock to Krugerrands so much. Investors would probably be smarter to make an investment in other gold coins as Krugerrands often run a bit higher than most gold coins. Copyright © 2011 BuyMetal.org All Rights Reserved.